We all know the story of the Count of Monte Cristo, it was a story of revenge, retributions and fortune. It was about a man who was imprisoned by a friend who stole all of his fortune. Instead of rotting in jail, he plots his revenge plan and plots his escape and he does escape and re builds his fortune once again so he can have revenge of the one who betrayed him. 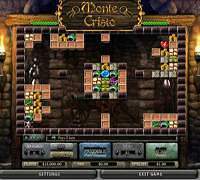 This game is themed around this exciting story and it invites players to accompany the legend of the Monte Cristo Count while getting the chance to grab their own shares of the fortune of the count. The amazing theme, mixed with the amazing technology and innovation of Cryptologic produces a game that is nothing short of amazing. Although the game is a slot machine and can be found under the slot gaming category, it does not have any reels or paylines, so players will not help the count by spinning the reels of the game, instead, they will bounce a ball that will strike down walls and different symbols in order to help him find the hidden treasures behind these walls. The ball can bounce and strike the walls up to ten times per round in order to reveal great treasures and high payouts. The game takes place in an underground dungeon as players will see the red brick walls with chains and torches of fire surrounding the reels of the game. As for the symbols that will appear on the game’s screen , they include crates, walls, golden coins, diamonds ,emerald rings and much more. In order for players to start the game, they will have to place their bets. These wagers can be found at the very bottom of the slot machine, they will find the Bet cell which allows them to place up to 500 coins. After they are done with the bets, they will be able to initiate the game by clicking on the Play button. The ball of fire will start bouncing off the walls of the game trying to strike down the crates and the walls to reveal the treasures. There are many symbols that are on the screen. These symbols have different meanings and some of them are bad and some of them give players great rewards. There is the green key, which will enable players to trigger the bonus round through which they can win great rewards, the gift symbol will give players five free games that they can enjoy without placing any bets, if players hit that symbol during the free games, they will earn one extra free game. There is also the bomb symbol which will give players great pays by blowing up all surrounding bricks, as for the heart symbol, it will give the ball the ability to bounce 3 times extra. There are bad symbols as well such as the skull symbol which will end the game instantly.